All four courses fulfilling the requirements for Content Areas One and Two must be drawn from at least four different subjects as designated by the subject letter code (e.g., ANTH or PVS). The ME curriculum satisfies Content Area Three requirements. Courses in Content Area Four can also be approved for one of the other content areas. Students are allowed to “double-count” one (and only one) Content Area Four course and use it to simultaneously satisfy part of the Content Area One or Two requirements. One course must have an International designation. Both courses can be International. For more information on any of these requirements, please contact your academic advisor or visit: http://catalog.uconn.edu/general-education/. Students are required to take two writing (W) courses. Students must take either English 1010 or ENGL 1011 prior to completing any (W) courses. (See the UConn Undergraduate Catalog — Academic Regulations). Either three years of the same world language in high school, or two semesters of elementary language at UConn satisfy the second language requirement. Each student will have an assigned academic advisor who is either be a professional staff member or faculty member. Advisors are available to assist students in navigating their academic career at UConn. An academic advisor will discuss course options and help you develop a four-year plan. You are required to meet with your academic advisor at least once a semester prior to course registration for the next semester. All first- and second-year ME students are assigned to Rose Hill (rose.hill@uconn.edu). If you do not know who your academic advisor is, you can look up his or her name and contact info here. Online Student Guides offer more information on adding, dropping, or swapping a class; registration pick times; schedule builders; and other questions related to registration. Each student must complete a Plan of Study form in the first semester of his or her junior year. Plan of Study forms detail how a student will meet curricular requirements. Refer to the Plans of Study link for more information. The Core Mechanical Engineering specific courses include: ME 2233, ME 2234, ME 3220, ME 3227, ME 3242, ME 3250, ME 3253, ME 3255, ME 3263, ME 3264, ME 4972, and ME 4973W. Other Core Non-Mechanical Engineering Specific Courses include: CE 2110, CE 2120, CE 3110, ECE 2000, ENGR 1000, ENGR 1166 and MSE 2101. Bottleneck courses are prerequisites to other courses. Students should pay extra attention to these courses when considering their curricular plan as a delayed bottleneck course can affect the graduation date. Example bottleneck courses include: ME 2233, ME 3250, CE 2120, and CE 3110. The ME Curriculum Map in the ME Course Map can be used to identify bottleneck courses (see link at the top of this page). This requirement is satisfied by 9 credits in 3000-level or higher Mechanical Engineering courses not used to satisfy any other requirement. No more than one ME 3299 course may be used toward meeting this requirement. This course work may also be applied towards a minor. 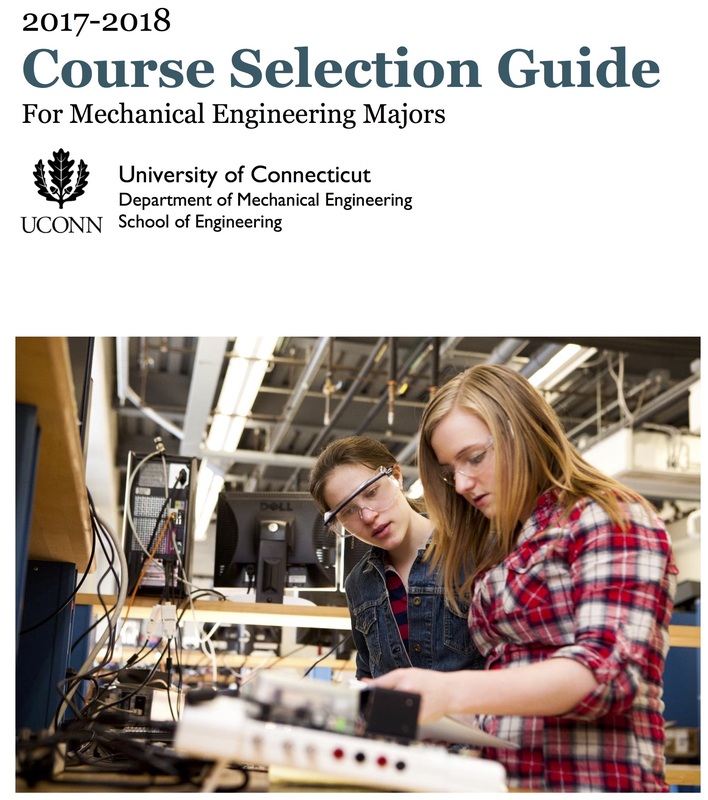 Any course meets this requirement except those listed under restrictions in the UConn Undergraduate Catalog — Engineering Section. Undergraduate Admissions offers a list of UConn equivalencies of courses transferred from 35 colleges/universities in Connecticut. The requirements of the home department of each major will determine the requirements for a double major. Generally, the number of credits should satisfy both majors. The student must meet the requirements of both, but will not need, e.g., 128 + 128 = 256 credits because many courses can be counted for both majors. A separate Plan of Study form must be prepared and submitted for approval to each department. Students may earn two separate bachelor degrees from two different schools or colleges of the University. Students must meet the requirements of both schools/colleges, and a Plan of Study form must be submitted to each department for each degree. To qualify for a minor, 15 credits are needed; however, a minor in Materials Science & Engineering requires 16 credits due to a one-credit lab course. 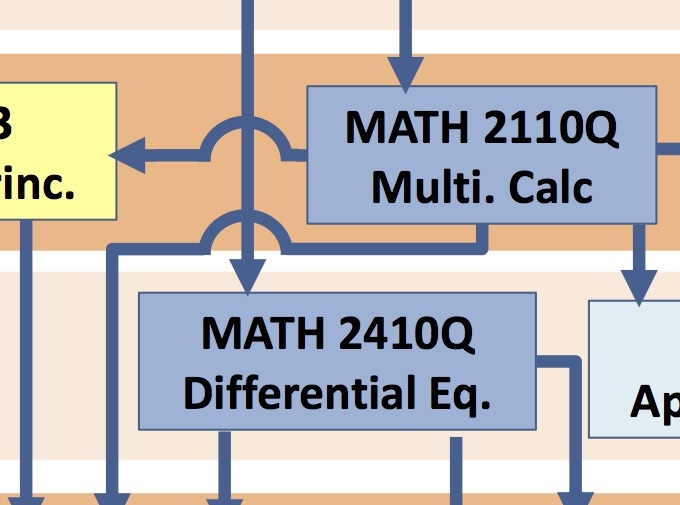 In addition to the 2 Math courses (Math 2110Q and 2410Q) listed in ME Requirements, three additional courses (9 credits) are necessary for a math minor. Please read the UConn Undergraduate Catalog “Minors — Mathematics” for details. (Note: “Pass/Fail” is not allowed except for credits beyond 128).